Although FRASER has a special focus on the history of the Federal Reserve System, our digital library also includes major collections from other banking and economic institutions and the private sector. In particular, our Federal Deposit Insurance Corporation (FDIC) historical materials have grown steadily since we first added an FDIC statistical publication in 2011. The history of the FDIC and Federal Reserve are tightly entwined. The Panic of 1907 and the loss of many depositors’ savings prompted the creation of the Federal Reserve System—and began repeated pushes for deposit insurance that eventually resulted in the creation of the FDIC. The 1907 panic also prompted federal and state governments to research banking systems and create new laws in an attempt to prevent future panics. Eight states created bank insurance programs to protect local bank customers, and Congress created a new central bank for the United States. However, the 1913 Federal Reserve Act focused more on banking structure than individual depositor protections. Not until after the onset of the Great Depression and the failure of more than 5,000 banks and thrifts (savings and loan institutions) was banking insurance on a national level successfully introduced. The Banking Act of 1933, popularly known as “Glass-Steagall,” after its authors, Senator Carter Glass and Representative Henry Steagall, not only separated commercial and investment banking, but also created the Fed’s Federal Open Market Committee (FOMC) and the FDIC. The act also required Federal Reserve member banks to become FDIC-insured. From 1933 to 1950, changes to the FDIC were made as amendments to the Federal Reserve Act, and only in late 1950 was the law governing the FDIC made into the standalone Federal Deposit Insurance Corporation Act. With this shared history, it’s only logical that FRASER’s FDIC collections have grown over time just as its Federal Reserve collections have. The collection began with banking data publications produced by the FDIC in conjunction with the Federal Reserve: C.8 Distribution of Bank Deposits by Counties and Standard Metropolitan Areas and E.16 Country Exposure Lending Survey. 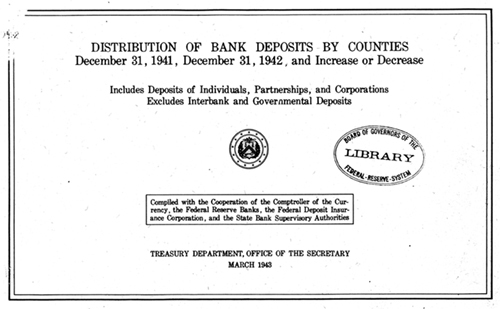 In 2014, we added FDIC annual reports dating back to the first published report in 1934. (New annual reports are added to FRASER yearly as they come out.) In 2015, we added the FDIC Quarterly, a current publication, as part of our collection of materials covering the development of the 2007-2009 financial crisis. The FDIC records at the National Archives include photostat copies of archival bank records, including this handwritten bank transfer between branches of the Bank of Indiana in 1837. We have also worked with our partners at the FDIC library and the National Archives and Records Administration to bring unique documents from the institution’s past into FRASER: FDIC chief economist Clark Warburton’s book-length reports on historical deposit insurance published in the 1950s, “Insurance of Bank Obligation in Six States During the Period 1829-1866” and “Deposit Insurance in Eight States During the Period 1908-1930,” are both available in full-text; Warburton’s research materials, part of the records of the FDIC at the National Archives, have also recently been digitized for FRASER. Another set of unusual FDIC historical materials are the long-out-of-print FDIC telegraph cipher code book and instructions to examiners, both furnished to FDIC bank supervision staff in 1934. Our most exciting recent addition, however, is probably the hundreds of speeches by more than 75 FDIC officials—chairmen, board members, research directors, and more—given from 1935-1990. (Interestingly, FDIC research economist Homer Jones would go on to be the “maverick” research director at the Federal Reserve Bank of St. Louis in the 1960s.) Like the statements and speeches of Federal Reserve officials, these public comments provide invaluable insight into the development of banking policy throughout the 20th century. If you’re interested in digging deeper into FDIC materials on FRASER, you can browse our new FDIC theme or keep an eye on what’s new to see announcements of new FDIC materials added. FDIC. “The Early 1900s” in “Historical Timeline: 1900-1919.” January 2, 2014. FDIC. “1933” in “Historical Timeline: The 1930’s.” January 2, 2014. Julia Maues. “Banking Act of 1933 (Glass-Steagall).” Federal Reserve History. November 22, 2013.